During the last years, many people in India and outside India have become aware of the need to establish the truth about the real history of India. Historical and archeological research has progressed greatly, and the debate in academic circles has become extremely interesting. Some books have been published, and websites are being developed. Due to the limited scope and size of this publication, we cannot include a complete history of India, but for the completeness of our discussion, we want to present some information found missing in the biased history that is taught in schools at present. Nothing happens to the (huge number) infinity, when any number enters (added) or leaves (subtrcated) the infinity. During pralaya many things get dissolved in Mahavishnu and after pralaya, during srushti all those things get out of him. This happens without affecting the lord himself. Like that, whatever number is added to infinity or whatever is subtracted from it, the infinity remains unchanged. During battle between Rama and Ravana, Mahiravana, the step-brother of Ravana kidnaps Rama and Lakshmana and takes them to Patala Loka through a tunnel. Patala Loka is described to be exactly below earth (then India) and one has to go 70000 yojanas deeper in earth to reach to reach there. Mexico and Brazil are exactly below India and one has to dig a hole(tunnel) of that distance to travel vertically. There are few such tunnels which are said to be leading to Patala Loka. The Patalkot valley in the Chhindwara district of Madhya Pradesh, India is one among them. 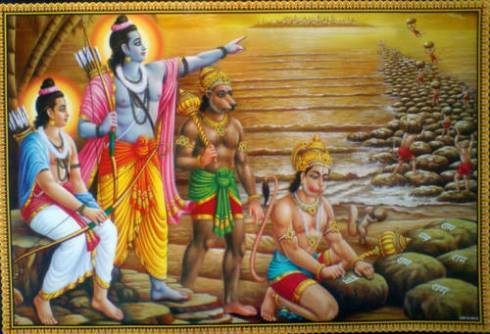 Ravana’s son Indrajit is killed by Lakshmana, Ravana calls his brother Ahiravana for help. Ahiravana, the king of Patala, promises to help.